On Thursday, December 19th on Rogers Daytime, I’ll be showing some Christmas treats from my Canadian Christmas Cooking cookbook, first published in 1979 and in print for almost 25 years, reprinted a couple of times over the years. I have updated the book, and Whitecap has put out a new edition this year. 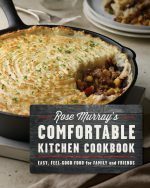 As the Canadian Press highlighted in their great review, the book “has stood the test of time, with recipes for roast turkey and goose, side dishes, fruitcakes, pies, plum puddings, cookies and other sweet treats favoured for holiday gatherings. 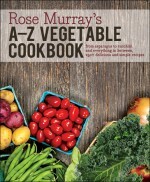 A chapter at the end features six menus for such holiday feasts as a French-Canadian Christmas, a traditional Christmas dinner, an early Canadian Christmas dinner, brunch, open house and a New Year’s dinner.” I will be demonstrating an easy Baked Cranberry Sauce….quicker than opening a can! Go to my Recipe page for that recipe. 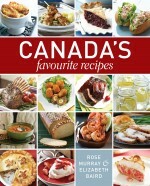 Tomorrow at the Royal Winter Fair I will be mentoring three students from Liason College, Oakville, as they cook and present to the judges a dish from my recent book Canada’s Favourite Recipes (authored with Elizabeth Baird). Since the book was short listed, we were invited to take part in “Taste Canada Cooks the Books” a stage event at which a number of culinary colleges will compete for the top prize to be announced at the Gala Reception on Monday, November 4th when the top cookbooks in the country will also be annouced. The recipe our students will make and plate from 1:30 to 2:30 is Gnocchi con Sugo de Pomodoro (Potato Dumplings with Tomato Sauce) contributed to Canada’s Favourite Recipes by Daiene Vernile, anchor and producer of CTV’s PovinceWide show along with a wonderful story about her arrival in Canada from Italy. Yesterday, I was lucky to be included on a Farm Media Tour sponsored by Farm & Food Care Ontario. Always a well organized day, this annual tour gives food writers an insight into where our food actually originates. This year’s tour featured two very different types of farming…a huge greenhouse venture in Flamborough and a goat farm in Caledon. Beverly Greenhouses Ltd. concentrates on 22 acres of seedless English cucumbers with a strong emphasis on environmental sustainability. The relatively new Escarpment’s Edge Dairy goat farm milks 300 goats with 300 kids born this spring alone. These two very different large-scale ventures had one thing in common….a farm that had been in the same family for generations, something that is not very usual these days. Before the delicious lunch held at the Halton Region Museum, guest speaker Dr. Schwarcz from McGill University in Montreal reassured us that biotech products are safe and in fact, beneficial to Canadians in making our food more affordable. The general public needs to be more informed about the safe use of pesticides and the breeding of plants to improve quality, increase yields and reduce undesirable characteristics in crops. There is much unfounded fear generated from a lack of knowledge in these areas. This is the type of information food writers can convey to the public, proving that the day’s outing lived up to Farm & Food Care Ontario’s motto…Awareness, Appreciation, Information. New Zealand Green Mussels are bigger, meatier and a bit milder than those we glean here on the East Coast. 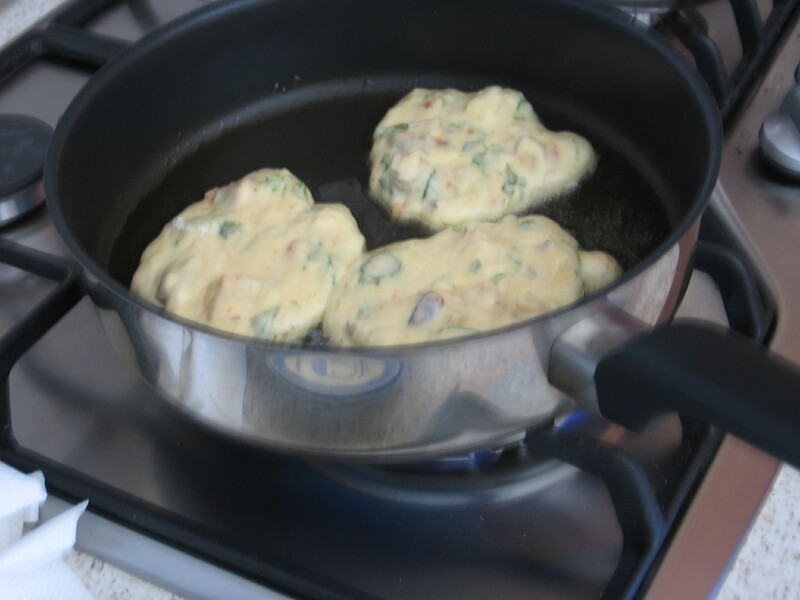 Mussel Fritters were on many restaurant menus of course, but very easy to make at home because most supermarkets and fish markets there sold cooked mussel meat. Fritters of various savoury kinds seemed to be the only distinctive Kiwi recipe I noticed, so of course, I had to make them. Try the delicious recipe on my Recipe Page. We have patiently waited for the lovely warm days we are now experiencing. This is what we left in New Zealand at the beginning of April. It had been a perfect summer there….clear blue skies and lots of warm, dry air. One of the best perks, however, was the fresh produce. 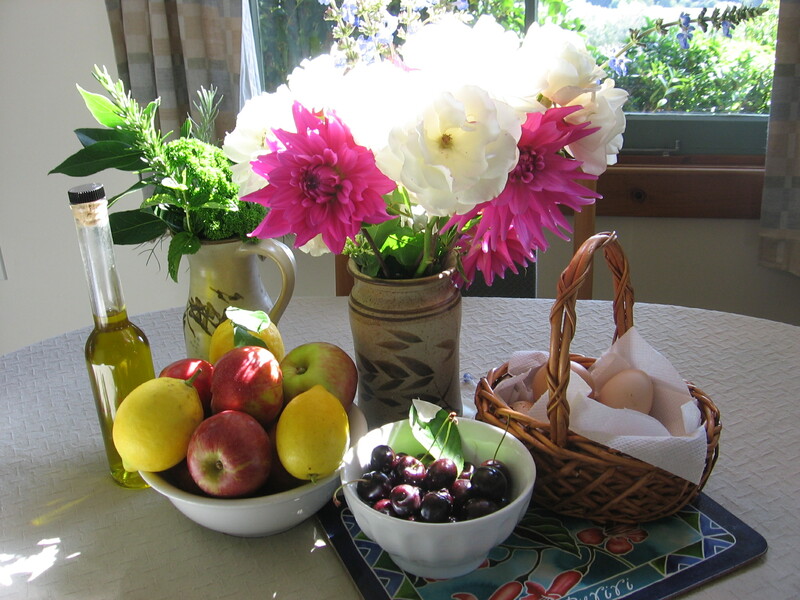 Everything seemed to be in season at once….berries, rhubarb, plums, apricots, nectarines, tomatoes, apples. Of course, they obviously didn’t all burst forth simultaneously, but the seasons are longer for produce down there. When we left, there was a hint of fall in the morning air, and the apples were in fact still on the trees, hanging in huge numbers just waiting to be harvested. Now, we can look forward to having our own fresh produce all summer now that our days are warmer and brighter. I had the opportunity yesterday to taste some amazing olive oil in Vincenzo’s fine food store in Kitchener. Gerry Shikatani was sampling Luque Organic Extra Virgin Olive Oil from Andalucia, Spain. It was peppery, but not as assertive as some and had the longest, smooth finish that seemed to last forever. It would be a wonderful finishing oil for cooked food or salads.